Yesterday morning we loaded the Suburban, picked up Bren’s girlfriend Olivia are 7:45 a.m. Central time, and headed to Bismarck to fetch our eldest from University of Mary. Olivia rode shotgun (five bucks who can explain why I decided to call her “Coach”) to the campus, and we played the letter game, the license plate game, talked, sang along to the iPod, and ate Hardee’s for lunch in Jamestown, N.D.
We reached UMary and Gabe and Olivia retrieved Bren from his dorm. He came out with a box, a backpack, a duffle bag, a cased guitar, an uncased mandolin, and his heavy Carhartt jacket. We had room for the duffle bag and the guitar–but we stuffed it in, crossed the river into Mandan, and headed south by southwest to the Dennis Ranch in Red Owl, S.D., for supper. Bren and Olivia held the guitar at bay with the backs of their heads. At dusk the deer were moving along the roads; darkness fell quickly, and fog rolled in, so we lost time peering in the the gray-black, watching for movement. We finally rolled up to Robert and Cindy’s new log house around 6:30 Mountain Time. The whole clan was there, waiting, including Fr. Tyler, who escaped his parishes for a Thanksgiving with his folks, his brothers Tate and Chance, and their families. Cindy, Hope, and Cass finished dinner, wrangled kids, and entertained Jodi, Emma, Trevor, and Olivia, while Bren, Gabe, and I help Robert and his sons move in a massive plank table edged in natural bark just in time for Thanksgiving. We enjoyed burgers and hotdogs, chips and salads, carrot cake, and Emma’s best oatmeal caramel chewies, and good beer (90 Shilling , picked up in Mandan). I woke this morning at 3:30, then again around 5 or so. Dozed until a little after 6, then showered and came went upstairs. Grandma Venjohn was next up, then one by one the rest of the family rose: everyone here but Jason and Carmen, who were hosting her family in Sioux Falls. Carmel rolls and coffee (and a little orange juice) for breakfast. Chris and Tally ran a Turkey Trot in Rapid City. Grandma, Matt and Brenda, and Brad and NaCole worked on snacks and dinner and watched the parade on TV, while Grandpa and our crew headed to 9 a.m. Mass at Our Lady of the Black Hills. Their regular priest, from Poland, was sick; the old priest who celebrated Mass looked familiar, and his deep baritone and easy humor called to me from the past. Finally, halfway through the Mass, Jodi whispered, “I think that’s Fr. Bob from Wall,” meaning the priest who was at the Catholic church in Wall, S.D., when we first met and she first lured me back to Mass. I knew as she said it she was right. During the sign of peace, I never more sincerely wished peace to those around me–and I’ve never felt more blessed to receive the Eucharist. We spoke to Father afterward. He didn’t remember us, of course, but knew we knew him, and (I hope) felt the love we have for him. We got home just in time to watch the Lions-Vikings game. Gabe, Emma, and Trev were wearing Honolulu blue and were heckled by the bulk of Jodi’s family, who are diehard Vikes fans. It was a good game; Lions won a bit before dinner, and we prayed together over the food. Not pork and beans, but turkey, ham, potatoes, stuffing, rolls, and squash. We ate, we played games, visited more, and some of us dozed. When the girls finally decided it was time for pie, we called Brendan upstairs to sing to him–he turns 19 today. Five different pies (apple, pecan, cherry, pumpkin, and pumpkin cheesecake) and real whipped cream. Brendan got a fleece blanket in UMary colors, three books, a capo and electronic metronome for his guitar, cards, and money. Some of us took a walk, others played Shut the Box and other games. At one point I went downstairs to find Bren, Olivia, and Gabe starting a rosary, so I joined in. Such peace–and such joy that they do this by choice. We ate a little more a little while ago. Now most of the family is playing cards: Phase 10 in the dining room; Texas Hold’Em in the kitchen. I’m surrounded by voices and laughter and love. Such joy. So grateful tonight. And we’re here ’til Sunday. Friends and family, I love you and am grateful for you. God bless you tonight and always. Today I finished another of my boss’s books, recommended to me by our research assistant, Ben, who was responsible for sorting the boss’s library as we moved from Morrill Hall to the Humphrey. I’d seen the book before, and it looked like a gimmicky, gifty book someone would use to decorate a shelf or display as light bathroom reading. 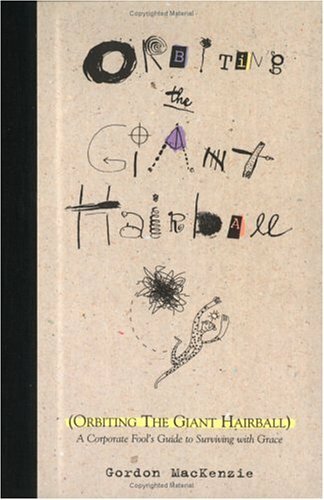 It featured multiple styles of fonts, “handwriting,” and illustration, and bore the oddball title, Orbiting the Giant Hairball: A Corporate Fool’s Guide to Surviving with Grace. I took it, exhaled, skimmed the opening poem by Rumi, glanced at the whimsically illustrated table of contents and a two-page spread that looked like a grade-school painting, and started to read. And read, and read, and read. The author, Gordon MacKenzie, worked 30 years at Hallmark, and this book is his attempt to show adults how to recollect their creative genius; to flush (or even remove) their PC, company-line filters and begin to really innovate and invent again…like when they were kids. For 30 years, he worked for a great “hairball” of a corporation, and for much of that time, he managed to orbit the hairball, close enough for mutual benefit, far enough to never be sucked into the mess and stifled. The book is, at times, a little New Age-y, but it’s inspiring, nonetheless. Here’s a guy who tends to say the things we wish we said, who pushes the envelope of acceptable behavior, gives the wrong answers, writes his own rules…and time and again, shows that it pays, both in terms of profit and personal fulfillment. You aren’t looking for me. The anthropology degree is all wrong—I studied people, not business. My work history skews journalistic, with infrequent forays into student recruitment and fundraising. Where I come from, branding involves a flame, a red-hot iron and singed hair. It’s difficult work, and it scars. That said, it’s not so different from what [COMPANY] does. Your clients want what every rancher seeks—a brand that leaves an indelible mark that the world will recognize and associate with its owner. It’s hard work, sure, so you do what any good foreman would: hire the best hands and stoke the fire. I had abandoned the way you apply for a job and had done something new. It paid off — both the HR manager and the hiring manager called me, stumbling over each other to set up a flight and an interview. I had successfully re-written the rules, and “The Hairball” had given me the benefit of the doubt, and a shot. That never happened, before or since. I’ve tried the revise that letter in applying for other jobs, but it doesn’t work. I’ve tried to build writing routines and exercises to spark consistent writing that moves me as much as, for example, last year’s Holiday Letter, but everything sounds forced and derivative. It’s frustrating…and then, as I neared the end of MacKenzie’s book, one of his main points struck me like a ball-peen to the forehead — rang my head like the ginormous bell that it is: Once creativity is routine, it is not creativity. You cannot do something completely different, over and over again. The cover letter accomplished its intended purpose; I can ask no more of it. Should I need another, I must again give birth. Which is hard work. But worth it. Blogger’s Note to His Bride: You’ve noticed I’ve been goofier lately. It’s the fumes from the rocket fuel, keeping me just clear of the Hairball. 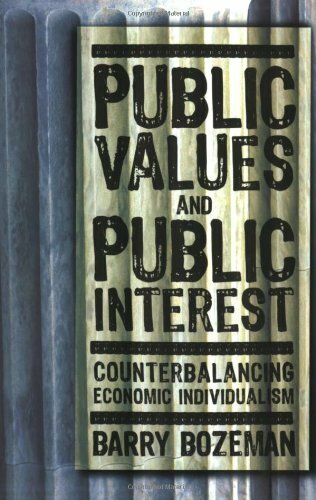 I have just finished another book I would not have read if not for my job, Barry Bozeman’s Public Values and Public Interest: Counterbalancing Economic Individualism. First, permit me to confess that, left to my own devices, I would read fiction, poetry, and an occasional history — so I am being forced to broaden my horizons and get educated, which is never a bad thing. Second, let me say that, as a wannabe writer, I have many, many thoughts about this book, mostly concerning its readability. I would not say that I enjoyed it, but it did provoke thought. The primary thought it provoked may be worth sharing. I say “may be” because I am not an economist, a philosopher, a political scientist, or a public interest or public management theorist, so it’s possible that I simply didn’t get it. Especially in the U.S., a vast nation with remarkably diverse cultures, religions, lifestyles, and economies depending on where in the country you reside, it seems to me that the more immediate the “public,” the more practical and realistic it is to identify shared public values and pursue the public interest. At the state level, this becomes less realistic: every state in which I’ve ever lived has had marked, or even deep, social, economic, political, and cultural divisions (“Outstate” or greater Minnesota versus the Twin Cities metro. East River versus West River. Downstate versus the U.P.) and different lifestyles worth protecting. At the national level, then, it seems unlikely that we could identify public values and a cohesive public interest, aside from the broad priorities of securing the nation and preserving our rights to life, liberty, and the pursuit of happiness. The difficulty of pursuing public values and the public interest is not identifying values and interests — these are abundant, diverse, and obvious — but identifying who shares them, which helps to decide at what level of society they should be implemented. The critique of economic individualism (which, says Bozeman, is increasingly driving our public policy agenda) in the book insists that individuals in this model are concerned primarily with their own economic interests, and perhaps those of a few close others (immediate family and the like). That may be the proper definition of economic individualism, but I don’t know anyone who lives this way. As a friend in Western South Dakota has explained, in his part of the prairie, neighbors take care of each other — and if someone doesn’t contribute to the good of the community, over time they are made unwelcome. They simply don’t last. Those who remain recognize that it is in their personal interest to take public interest: to be engaged in the community and preserve their shared values and lifestyle. I enjoy a similar experience in “The Bubble” — the devout, small-town Catholic communities in Albertville and St. Michael. My circle of public interest begins at home, with my family; then expands to encompass my parish and the people with whom I share a fundamental belief system and way of life; then to my town(s), which provide the education my children receive and the goods and services we need to live and thrive; then to my state and nation, which should be responsible for ensuring my towns, parish, and family have the opportunity and freedom to thrive. I invest what time, talent, and treasure that I am still free to spend as I wish in the circles closest to me — which makes sense, since the more distant circles I am already obligated by law to support. It seems to me that Bozeman’s approach to identifying public values, public interest, and ultimately, instances of failure of public policy to deliver in the public interest, is useful in inverse proportion to the size and distance of the “public” considered. At the local level, the public interest is much easier to identify — because although our population is increasingly diverse, we tend to cluster together with likeminded folks who share similar values. But as long as the majority of public resources are allocated at the state and national level, we will struggle with coming up with one-size-fits-all solutions to generic political issues that approximate real-world challenges, but do not reflect the actual problems of real people living in genuine community with each other. I turned 36 years old today. Last year on this date I joked that I was a third of the way through my life (not half, as some had suggested). 105 seemed like a reasonable age for which to aspire: far enough past the century mark so it doesn’t look like you were stretching for a milestone, yet not so far past that you appear to be going for the record. This year I thought about it again — 105 — and it seemed less like a joke. Why not? I’ve got things to do. 105 then. That’s the plan. First I informed Jodi, so if she wants to go first, or wants to try to outlast me, she can plan accordingly. Then I thought about this blog post. If 105 is the mark, at 36 I’ve officially entered the second third of my life — middle age — except lucky for me, middle age lasts until 70, at which point you may consider me an “older American.” I don’t intend to retire. I also noticed that so many things have sucked up my time in this past year that this is only the 30th blog post of the year (compared to about 158, year-to-date, in 2008, which was my peak year). Sad. So sad, in fact, that my good friend Jinglebob at the Dennis Ranch blog actually briefly cut me from his blog roll for several days prior to the election for insufficient presence. And since one of the things that has not changed as I enter the second third of my life is my desire to write, I figure I ought to remedy that right off the bat. Beginning today, and continuing each Wednesday for the next year (at least), I will post a Second Third entry, about where I think I came from, and where I think I’m headed. Navel-gazing? Perhaps. But I’ll try to make it worth your while — and hopefully as I get into the swing of a weekly post, others will follow. Oh, and Yield and Overcome? Sounds to squishy for my second third. Gonna have to remedy that, too. Welcome to my Second Third. I’m genuinely glad to be here, and thankful you came, too.